For your information, an anonymous donor has generously offered to match donations made to this initiative up to RM10,000. Funds will be raised in phases. 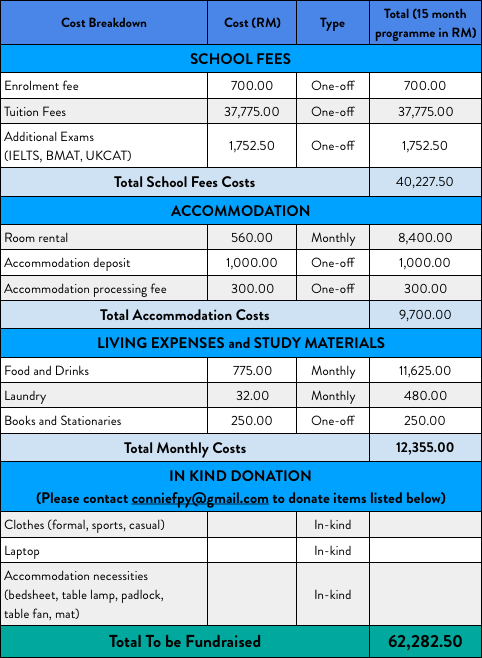 Once the previous phase has been successful, funds will be disbursed and the next phase will be made open to receiving donations. We also welcome in-kind donations. *A more extensive breakdown can be requested at the email listed below. Through our work teaching in school and now working with bright students to help them access higher education, we met one exceptional boy who grew up on the outskirts of Kuala Lumpur. His name is V, and he will turn eighteen this year. V was born here in Malaysia, and adopted as a baby. Due to some complications, he has wound up as one of the many stateless children in this country. 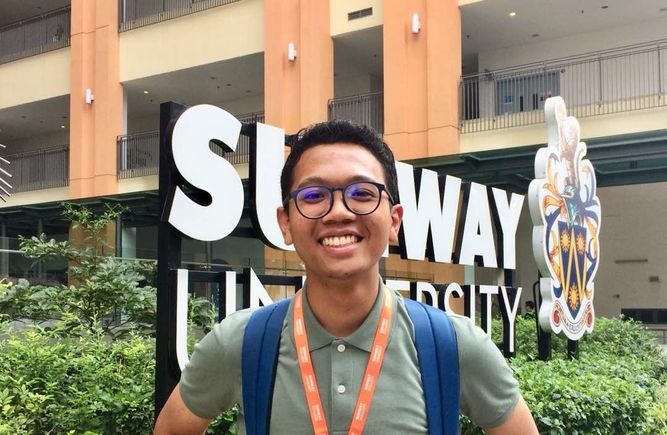 In spite of not having an IC, the teachers in the secondary school he attended recognised his potential, and ensured that he was able to sit for SPM and graduate with a certificate. V did really well in SPM, scoring straight As (2A+, 4A, 3A-). This is no mean feat, especially knowing his socioeconomic circumstances and the low-income community in which he grew up. He has shown incredible resilience and determination to beat the odds in his life. V has overcome tremendous odds to get here; it does not seem right that his promising trajectory should stop here. Because V is stateless, there seemed to be no way he could further his studies even with such excellent SPM results. He spent the entirety of last year (2017) working full-time at a restaurant to support himself while figuring out how to overcome his challenges (V could not expect to rely on his foster family for much longer after SPM ended). When this year rolled around, we could not afford to see V in this limbo anymore. We decided the best way forward was to crowdfund for his school fees and living expenses as V is ineligible for scholarships due to his statelessness. In early March this year, we reached out to a private college, and thanks to the strong support from the Head of the A Level programme, we got V enrolled, and he was finally able to pick up his studies. V's dream is to become a doctor and dreams of the day when he would be able to travel overseas to further his studies. For now, we simply want to see him being able to continue with his studies while we continue helping him separately on getting him his citizenship. Strong support system and network at this particular college. We believe the support here is crucial to help V do well in his studies and further his growth. The Director of the A Level programme is a strong champion who has met V and assured us of the support he will receive. We also have friends both working and studying in this college we know V can rely on, and will look out for him. Best fit given V's potential and capabilities. A child’s circumstances should not limit his potential and opportunities. V is a boy with immense potential and remarkable resilience and intelligence. Having him in the A-Levels programme will provide him with educational opportunities that will enable him to achieve his potential. Once you meet him and get to know him personally, you would ask why not. The worst case scenario is that V would be done with his A Levels in mid-2019, and still have not obtained citizenship. If that happens, we will explore local options for V to continue his undergraduate studies; already one private university has kindly offered a possible opportunity (subject to his results). An anonymous donor has generously offered to match donations made to this initiative up to RM10,000. This is a special, one-off fundraising initiative to help V pursue higher education, and not directly connected to Closing The Gap's core activities at present. We are doing this because we feel very strongly about helping a remarkable young man who is still holding his head high in spite of what seems a bleak future. The funds will be safeguarded by the Closing The Gap team and donors will receive periodic updates on the funds and where it has been spent. For more details, please contact us directly at [email protected]. Closing The Gap is a programme that aims to improve access to higher education for young people from disadvantaged backgrounds. We provide support for post-schooling options for our scholars, personalised mentoring and career guidance to help them achieve their fullest potential.